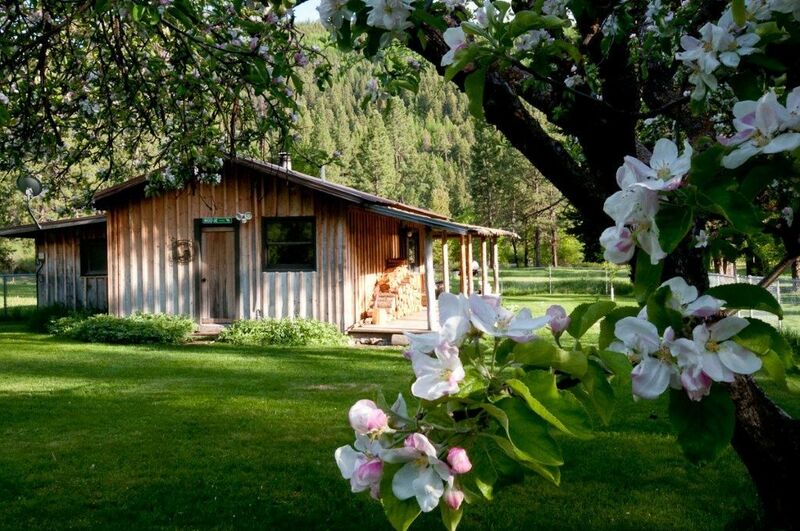 This cozy 2-bedroom cabin is located off the pristine Lewis and Clark Trail (US HWY 12 W),8 mi. south of Missoula and another 11 1/2 miles west of Lolo. The 2013 Forest Fires impacted the mountains around it for a short distance and then the Lolo Peak Fire in 2017 impacted other areas around. There are still beautiful mountain views that are in the distance. You are able to see the affects of both fires and the environmental impact. Much of Lolo Peak, Lolo Creek and close mountains were untouched by the fire, grazing elk, deer and moose. Outstanding hunting, fishing, snow shoeing, snow mobiling,four wheeling,skiing, hiking, biking, soak or swim at nearby hot springs. The night stars are gorgeous from the hot tub during clear nights. You may also enjoy Missoula's many coffee houses, breweries, distilleries and restaurants or seasonal activities that are yours within a short driving distance. You will enjoy a memorable stay in this charming cabin. This area is outstanding for outdoor activities as well as activities in the city of Missoula or a drive down the Bitterroot. The cabin is quite nice with a nice living room area which includes satellite tv, wifi internet (that is spotty occasionally with cloudy weather), 2 bedrooms with queen log beds, a nice kitchen and a quiet outdoor deck. A great place to come and relax and venture toward the plethora of sights to see or game to hunt. Very comfortable and relaxing, country style cabin that is nicely decorated with log beds, electric baseboard with wood stove backup or for enjoyable or romantic aesthetics, with plentiful wildlife in the area. The Whispering Moose felt like home from the moment we walked in. This an amazing little place and if the walls could only talk, man what stories they might tell. There is a great story written by Smith Henderson the son of the owners about this very cabin, the property and the Bitteroot fire of 2013. You guys have been here a long time. We were very pleased to be staying in your home and only being 9 miles from the Granddaughter was an added bonus. We never did actually meet the hosts but Jan was very prompt to answer all communications. We will be trying to book here again on our next visit this summer. Thank you for sharing your piece of Montana. I am so glad you enjoyed it. I was sick for a week so wasn’t getting out. I will meet you next time. I’m glad you enjoyed it. We enjoyed our stay at The Whispering Moose. It is ideally located in reach of both Missoula and the surrounding natural areas. This house was so cozy and comfortable for our family. We enjoyed the hot tub and the beautiful nature. Thank you!! We very much enjoyed our stay. The cabin is so cute and cozy, the fenced yard was great for our dog, and the location is perfect: out of town, but not too far out. The cabin was a perfect country location for a week's stay, exploring nearby sights... and owner Jan was a splendid host; helpful and friendly when needed yet never intrusive. My sister and I (in our late 60s) went west on Hwy 12 to enjoy fall foliage, picnics by babbling streams, and jaunts into mountainous Idaho. South in Hamilton, we toured the 24,000 sq. ft. Daly Mansion and learned much about local culture. We had a memorable day in picturesque downtown Missoula window-shopping and walking the farmer's mkt. We picked the wrong day to visit Old Fort Missoula -- check winter hours -- but will definitely go back to see the 34,000 artifacts in the museum, WWII prison detention areas, and other preserved buildings. Just walking the grounds was fascinating. The cabin was well-equipped to make our own meals but we also treated ourselves to several evenings out at Jack's Saloon/Restaurant in the country just up the road 5 miles and right on 2 miles of hard-packed, oiled dirt road. It is family-run with good hearty meals. We spent many an hour at the cabin just relaxing with coffee on the verandah and soaking in the quiet surroundings with the dog enjoying her fenced-in yard. Tho cellphone service was non-existent at the cabin, we didn't mind in the least and my computer ran fine with the cabin's WIFI connection. One week wasn't enough to fully experience all the area has to offer. We'll be back. And my motorcycling husband wants to mosey along the scenic, twisty Hwy 12 road and sit in the outdoor hot tub on a starry evening. Area is located 8 miles south of Missoula and 11 miles west of Lolo, 60 minutes from Hamilton and is plentiful with wildlife and outdoor activities from hunting, fishing, snowmobiling, snow shoeing, four wheeling, skiing, hiking, biking, soak or swim at Lolo Hot Springs or enjoy Missoula's numerous coffee houses, restaurants or seasonal activities within a short driving distance. This is suitable for a relaxing getaway, romantic week, excellent hunting and fishing area.